As we said last year, the Volkswagen Golf GTI TCR Concept will reach production and they have officially revealed the touring car inspired model to slot between the GTI and R models. 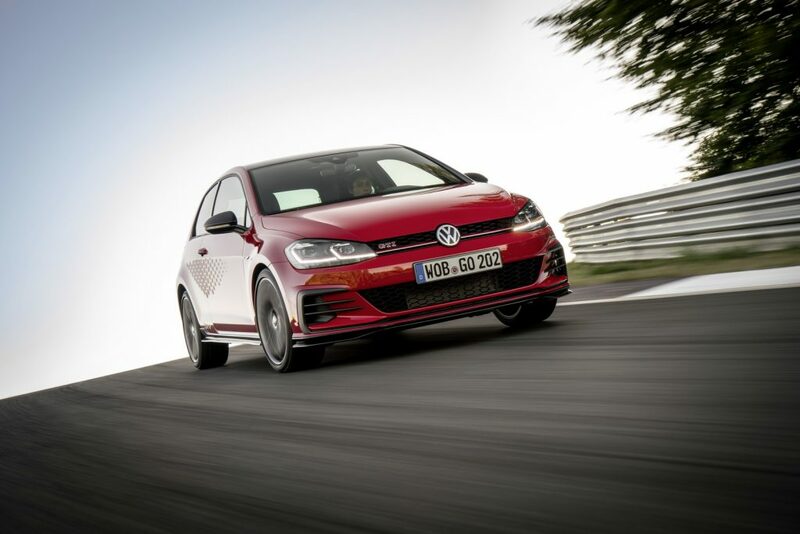 It packs 286 hp (213 kW) from the 2.0-litre turbocharged four-cylinder engine which makes it 44 hp (34 kW) more potent than the GTI and just 10 hp (7 kW) less than the R.
The seven-speed dual-clutch transmission channels the output to the front wheels, for a 0 to 100 km/h (0 to 62 mph) sprint time of 5.6 seconds, while top speed can be optionally increased from 250 to 260 km/h (155-162 mph). Thanks to a few cosmetic upgrades you will be able to tell straight away that it is the TCR version. A new front splitter, side sill extensions, roof spoiler and diffuser are all specific to this model. It also gets 18-inch wheels, black side mirror caps, LED headlights, a front-axle differential lock and perforated brake discs. You can add a new honeycomb foil for the side panels, black roof and carbon mirror caps to your spec. Once inside, users will find front sports seats with new microfibre/fabric design, an exclusive sports steering wheel and red accents all around. Order books have already opened in Germany, where the starting price stands at €38,950 ($44,554), tax included. It will be coming to South Africa in the second quarter of 2019 with an unknown price as of yet (we estimate a tag of around R680,000 to R700,000).